Thanks to Whitney Dixon and Liz Titus who were first-time volunteers from Apple Computers. They helped us get close to finishing boxes for the 2019 shipment. We hope to see them again! On March 29, Dell’s Team Diaz volunteered. They processed 21 boxes to get us started for the 2020 shipment. Pictured are Monica, Scott, George, Chelsea, Christina, Yvonne, Lisa, Julie, Gracie, Danny, and Janna. We are so appreciative of their hard work and enthusiasm. On January 25, our faithful volunteers from Dell GPP completed 19 boxes, helping us get very close to finishing the shipment for 2019. Pictured, standing in front of all those completed boxes, are Shyrla, Isela, Wendy, Natasha, Jamie and Patricia. We appreciate their dedication so much. On January 11, these Dell volunteers completed 13 boxes. Thanks to Edna Moscheo for organizing this great group of volunteers. Pictured left to right are Cyun Gan, Edna Moscheo, Sarah Olow, Sandra Robinson and Cliff Jamison. Pictured are CCO group volunteers Rocco, Kristen, Lana and Luisa. Pictured are GPP group volunteers Shyrla, Thang, Diana and Amanda. On December 14, two groups of Dell volunteers worked together to complete 23 boxes, a tremendous help which we appreciate. Thanks to Dell CCO and GPP groups for their hard work. 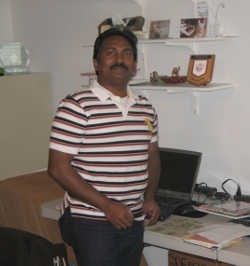 On December 7, six workers from Dell’s IT Global Ops completed 14 boxes. Organized by Vijay Raj, he brought 5 new volunteers. We appreciated their help so much! Left to right are Arman, Manish, Vijay Raj, Dave, Naz, and Shawna. On November 9, a group of 12 volunteers from Dell Configurations Services prepared books for borrowing. They completed 20 boxes for us. We were so grateful to see that big stack of finished boxes! Volunteers were Richard Cooper, Robert Sosa, Raymond Daron, Randy Maynard, Jovan Nikolesko, Sabra Louton, Joel Tacorda, Christina Rattanavong, Amie Rodriquez, Brittany Kennedy, Tara Detweiler, and Harmonic Sullivan (not pictured). On October 26, a dedicated group of volunteers from Dell’s Americas GPP team prepared books for checking out. The 12 volunteers from left to right are Diana, Grant, Pooja, Tahmira, Wendy, Thang, Sean, Shyrla, Amanda, and Patricia. Not pictured were Kay and Maggie. They completed 20 boxes for us! 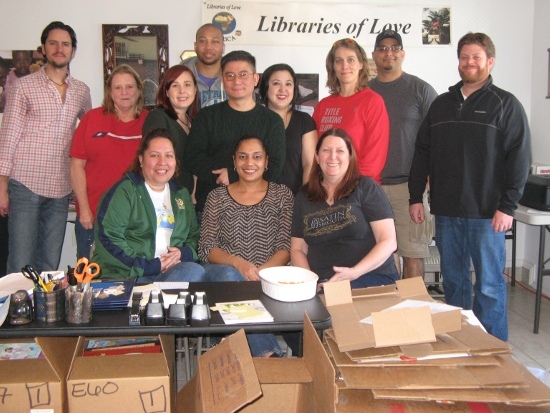 On October 12, this Dell group organized by Christopher Dykes prepared 9 boxes of books. We were happy to welcome the 3 new volunteers he brought with him. Pictured left to right are Roberto Saeki, Christopher Dykes, Pei-Ling Hua, and Michael Nguyen. Thanks for your support. On September 28, we welcomed a new group of Dell volunteers from Networking SPMs/Commodities. They completed 14 boxes. We appreciate their service and hope they will return again. Pictured are Tim, Christina, Gerardo, Rindy, Tyson, James, and Brian. On September 14, the Global Production Planning (GPP) group of 6 completed 14 boxes. From left to right are Arun, Janeth, Amanda, Shyrla, Jamie and Alex. Thanks for your support. We appreciate your volunteerism. May 18, we had a great group of 12 Dell volunteers from Global Production Planning complete all 23 boxes that we had ready to process. We were delighted to welcome some new volunteers as well as many faithful workers, all led by Shyrla Zapata. April 27, a group of 9 wonderful volunteers from Dell GCSO led by Bridget Montemayor completed the first 19 boxes for our 2019 shipment. Thanks for all your hard work! On February 2, Dell volunteers from America’s GPP group led by Shyrla Zapata completed the final 27 boxes for our 2018 shipment. They love to volunteer for us, and we are always so grateful for their help. Shipment to Uganda is tentatively scheduled for the week February 19. Thanks to the 4 volunteers from the Dell IMO group led by Jo Scribner who worked with us on January 19. We are grateful for their help in completing 15 boxes. As always, we are so appreciative of our faithful Dell volunteers. Many thanks to Dell CS team for their hard work on November 17. They completed the 18 boxes we had for them. Pictured are, front row: Kristi Cooper, Betty Harris, Harmonie Sullivan, and Sabra Luton. Back row are Bill Kelly, Raymond Duran, Randy Maynard, and Richard Cooper. Thanks to the six volunteers from Dell IMO who prepared 20 boxes of books on November 3. Pictured, left to right, are Jo Scribner, Chris Kleiman, Victoria Reichman, Kristen Dolbeare, Mike Palmer, and Scott Hayter. Thanks to the volunteers from Dell GDO Marketing who completed 11 boxes on October 20. Many thanks to Carl, Rebecca, Sofia, Felicia, Andre, and Scott for all their help. 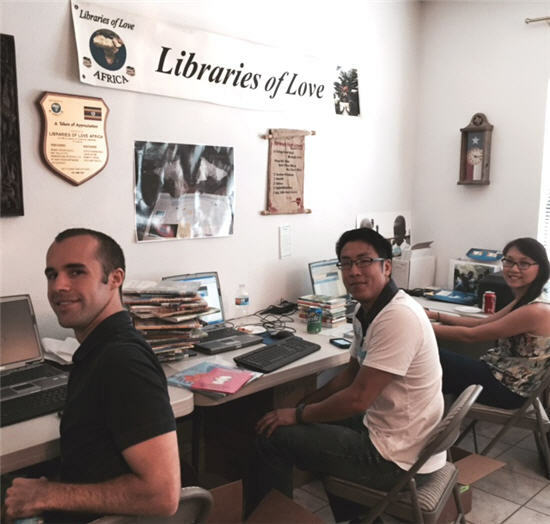 Thanks to Dell volunteers from the Americas GPP group who prepared books on October 6. Led Shyrla Zapata, thet returned for another very productive afternoon, completing all 21 boxes we had ready for processing. We are so thankful for the continued support from this group. Thanks to Dell volunteers who prepared books on September 22. They are, from left to right, Kristen O’Neal, Lana Acola, and Rocco Pape. We had another hard working group of volunteers from Dell this afternoon (September 8). Led by Shyrla Zapata, they completed 27 boxes. Pictured left to right are Wendy, Natasha, Patricia, Kathy, Amanda, Natalie, Zack , Shyrla (seated) and Analicia (not pictured). Thanks to all for a very productive afternoon! Thanks to the volunteers from Dell Global Eval who prepared books on June 16. They were a hard working group who finished all 23 boxes that we had. Our thanks to Harleen, Meenu, Rhett, Ginger, Diana C, Katie, Stephanie, Brynna, Rohit, Hannah, Carmen, Tripti, and Diana G.
On Friday, April 7, we had our first Dell group processing books for the 2018 shipment. The volunteers were from Dell’s EUC Configuration Services, and they completed 14 boxes. Pictured, left to right, are Anna Swanson, Raymond Duran, Olanda Sharp-Buckley, Bill Kelly, Amy Jackson, and Randy Maynard. The Global Evaluation Programs Team volunteered on February 16. They finished all 15 boxes that we had which satisfied our goal for 2017! Shipping will occur in March. Pictured left to right are Ginger Garner, Stephanie Regas, Brynna Vogel, Diana Garcia, Katie Bennett, Jackie Vallejo, Rhett O’Hara, and Diana Clukey. America’s GPP group from Dell (10 volunteers) finished 15 boxes on January 27, getting us so close to this year’s goal for 7 libraries in Kenya. Many thanks to this group led by Shyrla Zapata. They are faithful Libraries of Love volunteers. 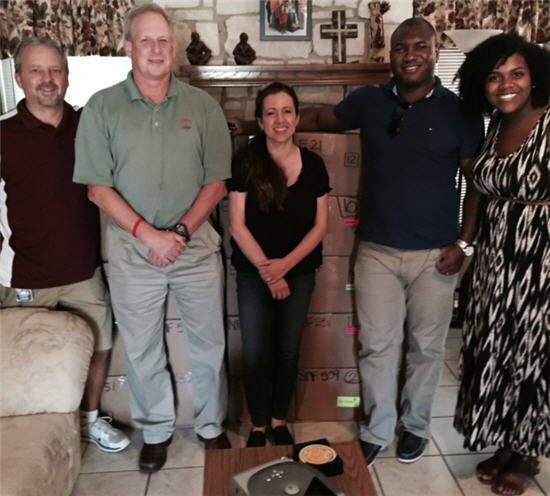 A group led by Felicia White from Global Dell Outlet processed 15 boxes on January 20. We are getting close to making our goal for 2017’s libraries in Kenya. The last Dell volunteer group of the year came to prepare books on December 9. Lydia, Jason, Kristen, Mohit, Nadia, and David completed 18 boxes. Many thanks to this group of hardworking Dell volunteers. Dell volunteers from Sales Stregy and Planning volunteered on November 11, 2016. Pictured from left are Felicia Zhang, Anna Montillet, Jonathan Mason, and Kristen Jernigan. Dell volunteers prepare books for check out on November 11, 2016. Dell services volunteers Liz Otero, Joe Roth, and Greg Sinney volunteered on November 4, 2016. 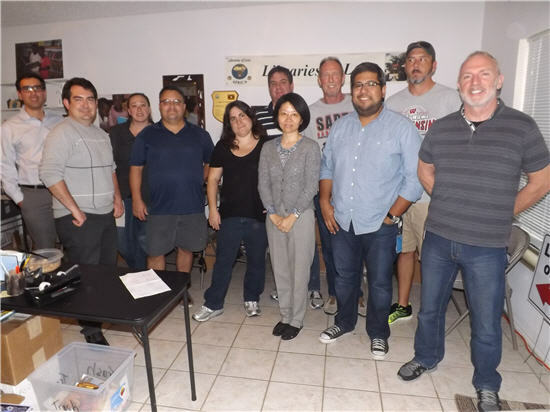 A wonderful group from Global Production Planning volunteered on October 28, 2016. They completed 18 boxes for us. They are from left to right Kristina, Shyrla, Andrea, Maggie Garrett, Diana, and Kathy. Our volunteers on September 30, 2016, were once again from DELL-Amer.GPP. This group has been such a dependable group of volunteers, and we are so grateful for their faithful service to Libraries of Love. Left to right in the photo are Andrea, Maggie, Martin, Jamie, Amanda, Thang, Wendy, Patricia, and Kathy. They completed 19 boxes! Led by Felicia White, this wonderful group of Dell volunteers completed 14 boxes on September 2, 2016. This group from Dell Enterprise Tools volunteered on July 8, 2016. They completed 22 boxes, which was really awesome. Pictured are, front row, Niki Zezulka, Tim Pael, Seetha Mahadevan, Georgia Thompson and, back row, Walter Sims, Steve Miller, Juan Lobo. Alexa Koenigseder, Clark Robinson, and Jan Bobak. These ladies from the Dell M&A group volunteered Nov 20. From left, are Lydia, Kristen, Cymone, and Jo. Thanks for your enthusiastic support. Dell Regional Ops Cell Global Materials team volunteered on Nov 13, 2015. We appreciate all the volunteers who keep coming back. Volunteeers from Dell Corporate Development – the ‘Dream Team’ – stand in front of boxes ready to ship after preparing books on Aug. 28. We are always grateful for the volunteers who make our work in Uganda possible. Thanks, Dell friends. Thanks to Dell volunteers Andrew Northcutt, Joshua Foo, and Jessica Lam for helping August 14. Love to hear Dell community volunteers laugh and exclaim as they prepare books: “I read this when I was a kid!” “This was one of my favorite books!” There aren’t words to express our gratitude. Over many years, endless volunteers have typed labels used on pockets and cards so Ugandan students can borrow. Especially nice is that many return over and over. The final Dell groups before this year’s shipment to Uganda. What a fantastic job from all the volunteers, all year long. Above is the Regional Ops group that came on February 6. Pictured in front are Amanda, Diana, and Shyrla. Standing are Pablo, Kathy, Natalie, Daniel, Thang, Patricia Jamie, Joaquin, and Nate. Picture at right is the volunteer group from Dell IT who came on January 30 – Jen Erickson, Ken Farrell, Nikole Pope, Hazel Quigley, Ching-Yean Ho, and Aileen McGarrahan. Together the groups completed 23 boxes of books, leaving only 10 to be done by the Monday volunteers to complete this year’s shipment. Cheers to all the volunteers! Thanks to the Dell volunteers who came on January 23 to prepare books. 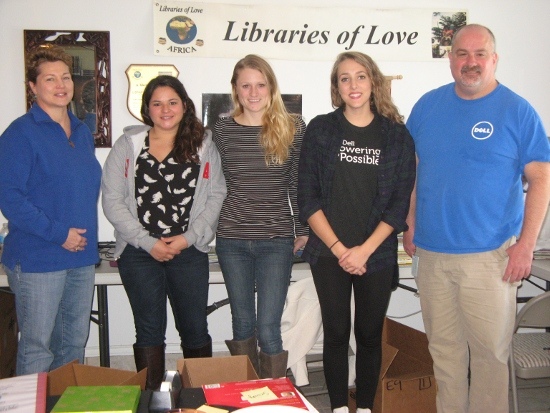 They completed 12 boxes for 2015 libraries.Pictured above, from left, are Tiffany Wilson, Veronica Irizarry, Micaela Schmitt, Alissa Hans, and Christopher Dykes. In the photo at left is Vijay Raj Yarijarla. 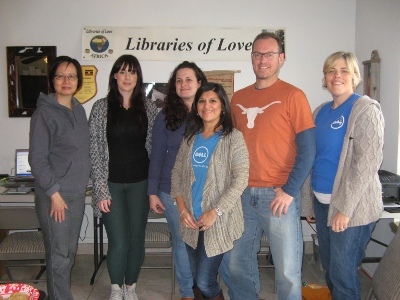 Thanks to the 6 volunteers from the Dell Sales Ops group who came on January 16 to prepare books for the 2015 libraries. They completed 12 boxes. Yea! Pictured, from left to right, are Kristen Oneal, Rocco Pape, Jason Wenmoth, Sofy Tarud, Anna Montillet, and Vanessa Williams. Thanks to the volunteer group from Dell Global Custom Solutions & Operations that came to prepare books for the 2015 libraries. We greatly appreciated the continued support of Dell employees and their generosity.